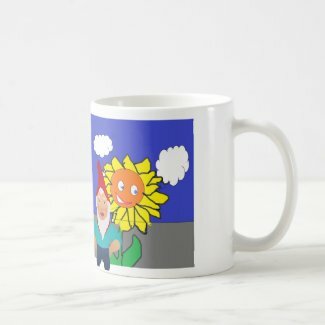 One of the great things about zazzle is that you can create stories and characters. 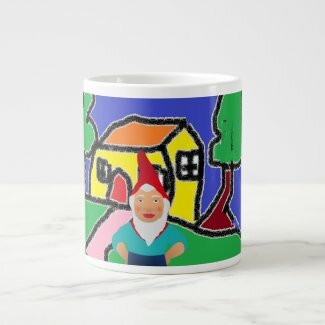 My latest character is GnomeHe is a neighbor and friend and he loves to share "mug shots"
Characters like Gnome can populate old holiday photographs, such as the one above or you can creat simple , "Naive" graphics if your drawing skill allows. This little house has appeared on several of my products but now has a second lease of life as Gnome's home. Also included in a list of revitalized characters is Sunflower. Sunflower of course is a resident of Gnomes garden and a dear friend for the summer. 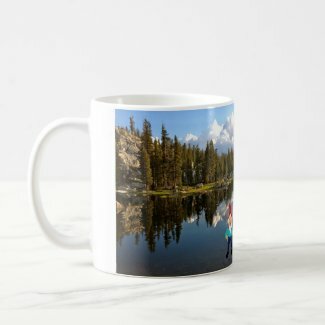 Here they share a photograph, of course added to a mug for their friends. See it is easy to build ideas from available material. You can use new material or re-use old designs in a new story. You are only bounded by your imagination for the stories that you can tell. O Of course this series of pictures shows only one product type. You can make make your story fit as many product types as you want. Have a try. You may be on to something great.